The Young And The Restless Star Joshua Morrow Celebrates Amazing Milestone! Whether he’s with Sharon or Phyllis, fans love having Nick Newman on The Young and the Restless for decades now. 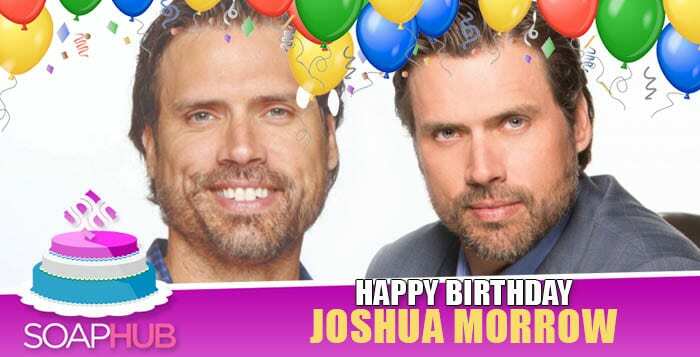 His portrayer, Joshua Morrow, has two terrific screen partners and now, he has something even more to celebrate! Morrow, who joined YR in 1994 as Victor (Eric Braeden) and Nikki’s (Melody Thomas Scott) son, is celebrating his birthday today! While Nick seems to be the role he was born to play, he’d actually auditioned first at the sister soap The Bold and the Beautiful for the role of Dylan, which went to Dylan Neal. After that screen test, he was soon scooped up at the top-rated soap and has been working non-stop ever since! Born in Juneau, Alaska, Morrow attended Moorpark College in CA, majoring in communications and minoring in theater. He’s been wed to his wife, Tobe, since August 4, 2001. Together, they have four children, sons, Cooper, Crew, and Cash, and a daughter, Charlie Jo. A team player at work and a coach for his kids’ sports teams, Morrow rarely steps away from Genoa City long enough to shoot another project. He co-starred with Rachel Brown in the USA movie My Stepson, My Lover, and he’s also appeared on The Nanny and played an obnoxious, self-important soap stud in an episode of The Stafford Project, a web series that starred Morrow’s former Y&R co-star Michelle Stafford (ex-Phyllis, now, Nina, General Hospital). Soap Hub wishes Morrow a happy birthday and many happy returns and you can too with the tweet link below!